Traditional Use: Used as a substitute for Indian Sandalwood in perfumery. Used in pharmaceutical purposes particularly as a disinfectant for the urinary tract. Benefits: Acne, anxiety, aphrodisiac, bladder infections, bronchitis, cardiac fatigue, catarrh, cough, cracked and chapped skin, cystitis, depression, diarrhea, dry skin, fluid retention, insomnia, laryngitis, nausea, nervous tension, scarring, sore throat, stress, vomiting. Australian sandalwood can be substituted for Indian sandalwood in most cases. It has the same fixative properties, and the aromas are very similar. Of Interest: Australian Sandalwood represents an ecologically responsible alternative to traditional Indian Sandalwood. A report published in the Journal of Essential Oil Research stated: "analysis showed that Western Australian sandalwood is related to East Indian sandalwood in terms of constituents." 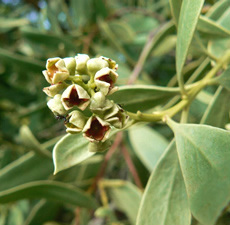 Australian Sandalwood, Santalum spicatum, is presently being produced in a sustainable, environmentally-responsible manner through ethically managed plantations. Western Australia is home to the world's largest sustainable Sandalwood reserve - 1.6 million kilometers, or roughly 3 times the size of France. Efforts are also underway to involve Aboriginal communities in equitable business partnerships that will provide income to these ancient indigenous residents as well as position them to accept greater responsibly over the environmental management of this valuable native resource. In addition, Australian Sandalwood harvests are subject to strict governmental regulation and oversight by the WA Department of Environment and Conservation.